Blooms and beauty welcome spring and summer in gardens across New York state! Search below by region and city to find fairs and festivals that offer you a chance to stop and smell the flowers. Visit Old Westbury, Sonnenberg, and Buffalo Botanical Gardens this summer! Poets say flowers feed the soul. Spiritual nourishment blooms year-round in thousands of public gardens in New York—from the Bronx, where the famous New York Botanical Garden has one of the world&apos;s largest glass conservatories, to rural Schoharie Valley where ancient oaks stretch amid 548 acres at the Landis Arboretum. Long Island&apos;s historic Gold Coast estates feature elaborate botanical gardens festooned with fountains and statues. Old Westbury Gardens, rated one of America’s top 14 most beautiful home and garden tours by Budget Travel, is so striking that three classic Hollywood films were shot there. The palatial Charles II-style mansion sits on a 200-acre property with eight formal gardens, wooded paths, ponds, more than 100 species of trees, and over 40 kinds of flowers, from lilacs to tropical water lilies. Historic Hudson Valley homes are surrounded by artfully designed gardens with majestic river views. In 1835 author Washington Irving carefully arranged the garden landscapes at Sunnyside and planted an exotic wisteria vine that still envelopes the house. The Beaux Arts gardens at Kykuit: the Rockefeller Estate display renowned 20th-century sculpture, and the Vanderbilt Mansion boasts lush Italian Gardens and nearly 2,000 rose bushes. Picture-perfect Innisfree Garden interprets ancient Chinese design. A meandering path reveals a series of hidden gardens that frame special features like a striking rock formation or a water sculpture. Cliffs, waterfalls and streams surround a large glacial lake on the 150-acre site. Named one of America’s best by the National Geographic Guide to America&apos;s Public Gardens, Innisfree remains a hidden gem. Find it at the end of a long country lane near the village of Millbrook. Tours of Sonnenberg Gardens, near Canandaigua Lake, include the 1887 Queen Anne-style mansion, greenhouses, and nine distinctive gardens with thousands of fragrant blossoms. Nearby in Rochester, explore the elegant gardens of the founder of the Eastman Kodak Company at the George Eastman House & Museum. In the Thousand Islands-Seaway region, cupids and rose gardens encircle Boldt Castle, set on a heart-shaped island in Alexandria Bay. 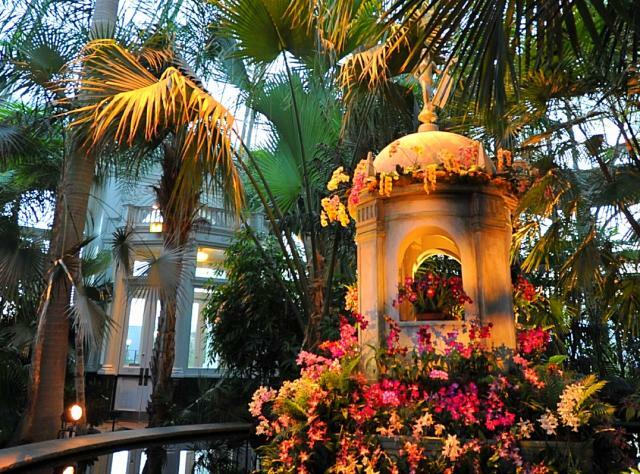 Monthly festivals celebrate the opulent Buffalo Botanical Gardens where—any season of the year—you can meander through a Victorian crystal palace filled with tropical plants. Other flowery events include Buffalo’s annual National Garden Festival, a summer-long garden party featuring 14 gorgeous garden tours—including America’s largest: Garden Walk Buffalo.